It has long been known that women with denser breasts are at higher risk for breast cancer. This greater density is caused by an excess of a structural protein called collagen. "We have shown how increased collagen in the breasts could increase the chances of breast tumors spreading and becoming more invasive," says Gregory D. Longmore, MD, professor of medicine. "It doesn't explain why women with dense breasts get cancer in the first place. But once they do, the pathway that we describe is relevant in causing their cancers to be more aggressive and more likely to spread." The results appear online May 5 in Nature Cell Biology. Working in mouse models of breast cancer and breast tumor samples from patients, Longmore and his colleagues showed that a protein that sits on the surface of tumor cells, called DDR2, binds to collagen and activates a multistep pathway that encourages tumor cells to spread. "We had no idea DDR2 would do this," says Longmore, also professor of cell biology and physiology. "The functions of DDR2 are not well understood, and it has not been implicated in cancer—and certainly not in breast cancer—until now. At the opposite end of the chain of events initiated by DDR2 is a protein called SNAIL1, which has long been associated with breast cancer metastasis. Longmore and his colleagues found that DDR2 is one factor helping to maintain high levels of SNAIL1 inside a tumor cell's nucleus, a necessary state for a tumor cell to spread. Though they found it is not the only protein keeping SNAIL1 levels high, Longmore says DDR2 is perhaps the one with the most potential to be inhibited with drugs. "It's expressed only at the edge of the tumor," says Longmore, a physician at Siteman Cancer Center at Washington University and Barnes-Jewish Hospital and co-director of the Section of Molecular Oncology. "And it's on the surface of the cells, which makes it very nice for developing drugs because it's so much easier to target the outside of cells." Longmore emphasizes that DDR2 does not initiate the high levels of SNAIL1. But it is required to keep them elevated. This mechanism that keeps tumor cells in a state that encourages metastasis requires constant signaling – meaning constant binding of DDR2 to collagen. If that continuous signal is blocked, the cell remains cancerous, but it is no longer invasive. So a drug that blocks DDR2 from binding with collagen won't destroy the tumor, but it could inhibit the invasion of these tumors into surrounding tissue and reduce metastasis. 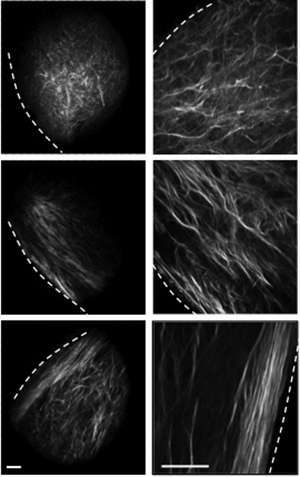 One possible way DDR2 may govern metastasis is its influence on the alignment of collagen fibers. If fibers are aligned parallel to the tumor's surface, the tumor is less likely to spread. While fibers aligned perpendicular to the surface of the tumor provide a path for the tumor cells to follow and encourage spreading. Tumors without DDR2 or SNAIL1 tend to show the parallel fiber alignment that is protective against spreading. "This whole notion of fiber alignment and the tumor interface is a hot topic right now," Longmore says. "Our co-authors at the University of Wisconsin have developed a scoring method for collagen alignment that correlates with prognosis. And the bad prognosis disappears when you take away DDR2." With the current emphasis on genetic mutations in cancer, Longmore is careful to point out that 70 percent of invasive ductal breast cancers show DDR2. But in 95 percent of these tumors the genes in this pathway – from DDR2 to SNAIL1 – are entirely normal, without mutations. "If you did genomic sequencing, all of these particular genes would be normal," Longmore says. "You have to be careful not to just focus on mutations in cancer. This is an example of normal genes put together in an aberrant situation. The change in the environment—the tumor and its surroundings—causes the abnormal expression of these proteins. It is abnormal, but it's not caused by a gene mutation." In early drug development efforts, Longmore and his colleagues have done some preliminary work looking for small molecules that may inhibit DDR2 binding to collagen. "Currently there are no DDR2 specific inhibitors," Longmore says. "But there is great interest and work being done here and elsewhere to develop them."